200ml~2000ml. | Hydraulically operated | Euro Series |Double Layer | Double Color | Coextrusion Series | Fully Automatic | Touchscreen Controller | Plastic Extrusion Blow Molding Machine. Suitable to make containers in Blow HDPE; LDPE; PP; Adflex, HM, EVOH, Pet-G & PVC materials. 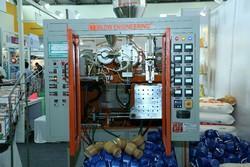 Looking for Double Layer Plastic Blow Molding Machine ?